While not an experiment, this gives you the historical context behind the efforts of scientists to amplify the neural signals that you regularly observe every day with Backyard Brains. For 235 years we have been trying to isolate, understand, and analyze the elusive action potential, and here we tell the story that continues today. We now enter the history. The amplifiers that gave us the first hint of the electrical impulses generated by neurons came from biological tissue itself! Scientists of the 18th and early 19th century used the contractions of muscles as "bioamplifiers" to indirectly measure neural firing. Using friction machines (spark generators), Leyden jars (primitive capacitors), or Voltaic Piles (the first batteries), electrical stimuli could be delivered to motor neurons that were still attached to muscles. The electrical stimulation would cause the nerve to fire action potentials (so people hypothesized), the muscle would then contract, and the force of contraction could be measured with a spring. 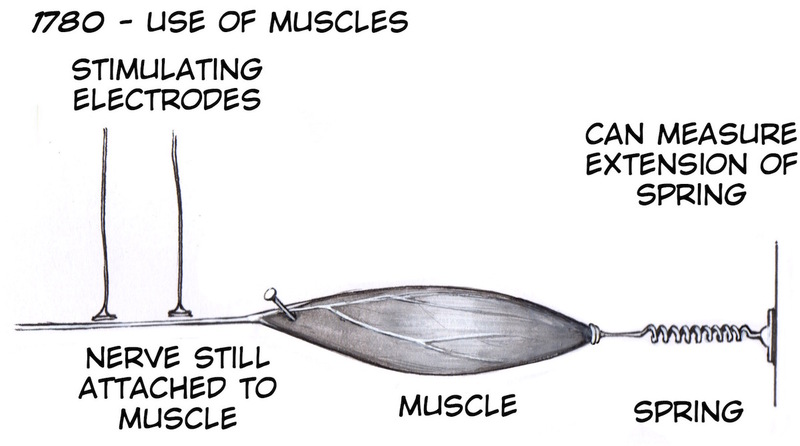 With increasing electrical stimuli strength (thus more action potentials in the motor neurons), the muscle would contract with increasing force. This technique worked, but led to vigorous debates as to whether the neural tissue was actually generating its own action potentials at all, or whether the muscle contraction was just a direct result of electrical stimulation. 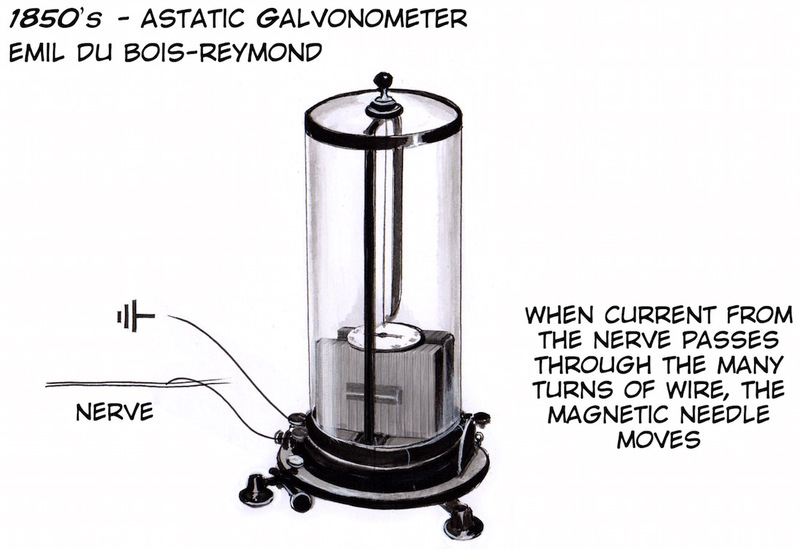 By the mid-19th century, galvanometers had been invented, and it was possible to see that nerves were indeed generating their own action potentials. These galvanometers exploited the then new technology of electromagnets. 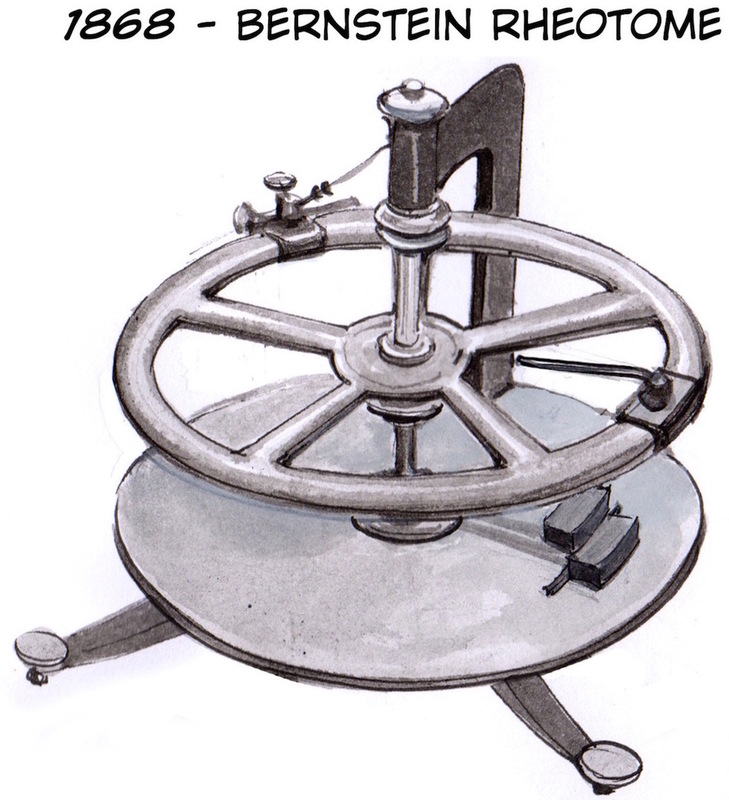 For example, Emil de Bois-Reymond built by hand a type of galvanometer with 24,000 turns around an iron plate. 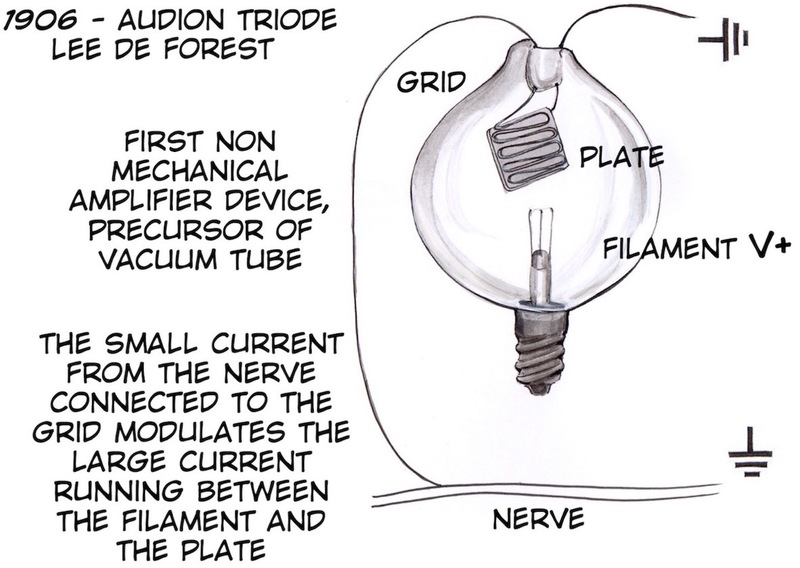 When the nerve fired action potentials, a metal needle suspended by the plate would deflect. These devices worked, but the needle movement was not fast enough to separate the 1 ms individual action potentials, and the machines occupied a lot of time to construct. In the late 19th century, French scientist Gabriel Lippmann invented the capillary electrometer, which consisted of a test tube filled with mercury and capped with a layer of sulphuric acid. A wire was connected from the nerve to the mercury bath and the ground to the sulphuric acid. 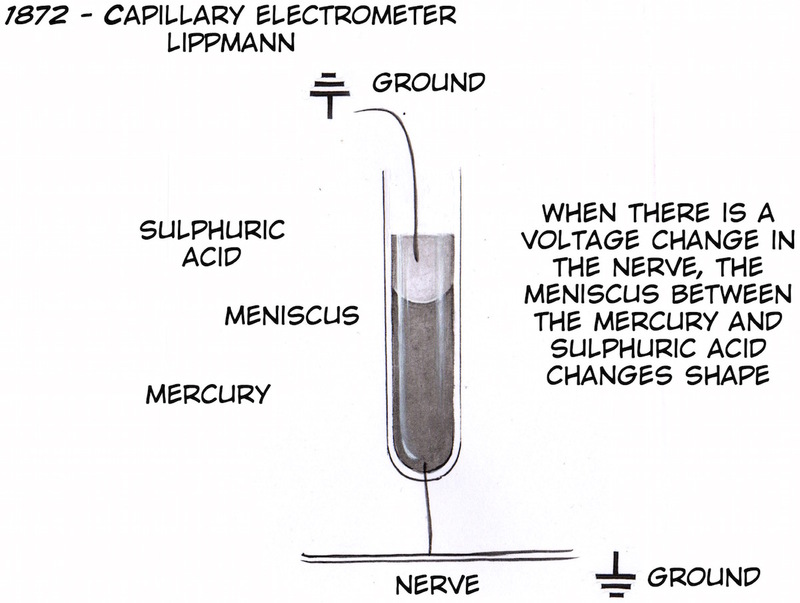 When the voltage of a nerve changed due to action potential firing, the shape of the meniscus between the mercury and sulphuric acid would change and could be observed underneath a microscope. A "liquid state amplifier," if you will. Capillary Electrometers were sensitive but, like the early galvanometers, also suffered from mechanical sloth (the meniscus did not change fast enough to isolate individual action potentials). 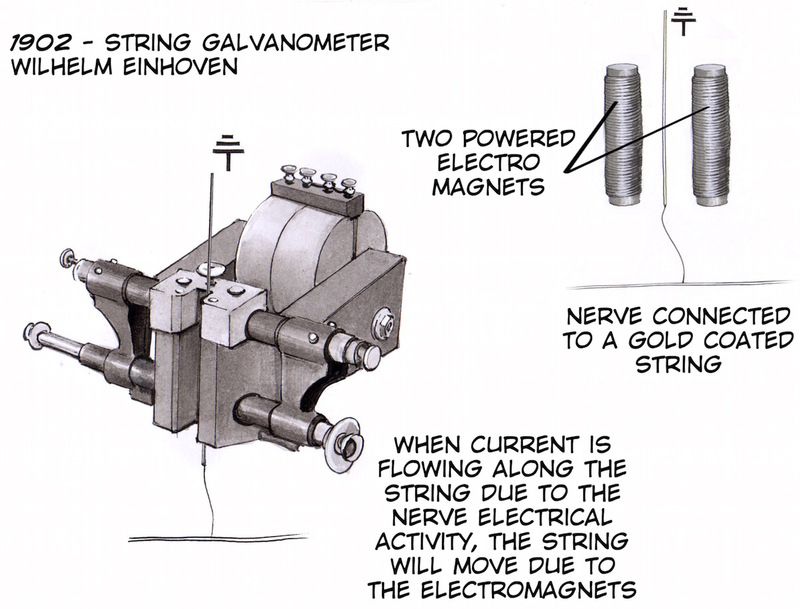 In 1902, on the cusp of the radio age and electronic revolution, Wilhelm Einhoven invented the most sensitive amplifier yet, the string galvanometer. This consisted of a gold coated glass string suspended between two high power electromagnets. Similar to the Astatic Galvanometer but more sensitive (as the electromagnets were actively powered), the string would oscillate when the nerve fired action potentials. A light could be presented on the string, and the movement of the shadow could be recorded on photographic film. Wilhelm used his string galvanometer to record the Electrocardiogram, for which he is famous. And thus the electro-mechanical era came to an end and gave way to the radio / electronic era. The radio pioneer Lee De Forest invented his Audion tube to amplify the radio signals transmitted from distant stations. And history never looked back. Rapid technological developments of radio technology followed, giving way to the vacuum tube, which allowed the work of neuroscientists of the early 20th century, such as Edgar Adrian, Hodgkin & Huxley, Erlanger & Gasser, etc., to finally isolate and understand the action potential. Sweden gave out many medals. Vacuum tubes were used extensively in the first half of the 20th century, but they were notoriously fragile and power hungry. To improve the reliability of long distance communications, the trilogy of scientists Bardeen, Brattain, and Shockley at Bell Labs developed the most important invention of the 20th century: the transistor, a wonderful little device we have previously discussed in detail. 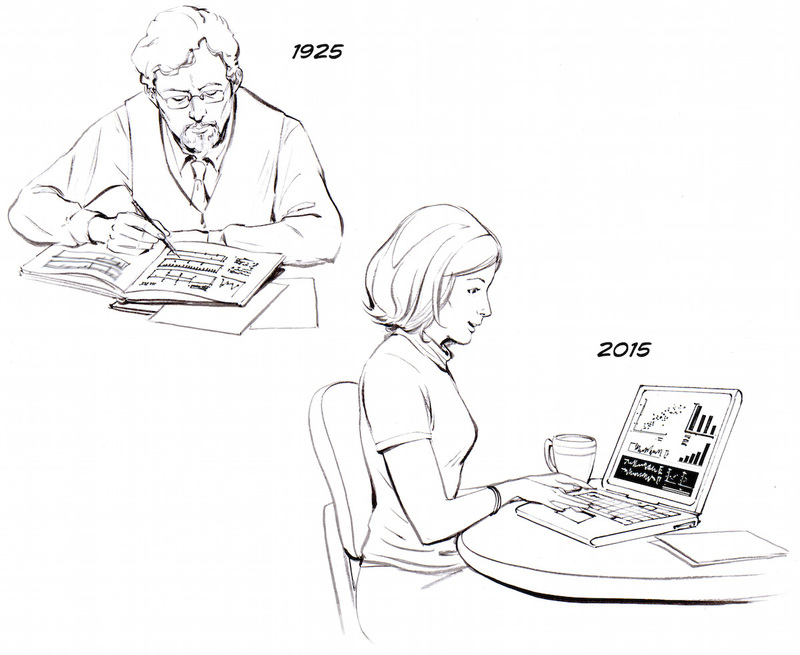 Thus, in the 50's and 60's scientists began using transistor-based amplifiers to measure neural signals. The transistor also had an important cultural impact on the youth of the era. But, a problem remained to be solved in circuit design; you still had to solder wires, transistors, capacitors, and resistors together to build a circuit (open an electrical artifact built before ~1965 to see this), making complex circuits labor intensive to build and susceptible to failure. For example, building a DIY SpikerBox by hand in this epoch would have required a couple hundred of components, rather than the 24 discrete parts it currently has today. 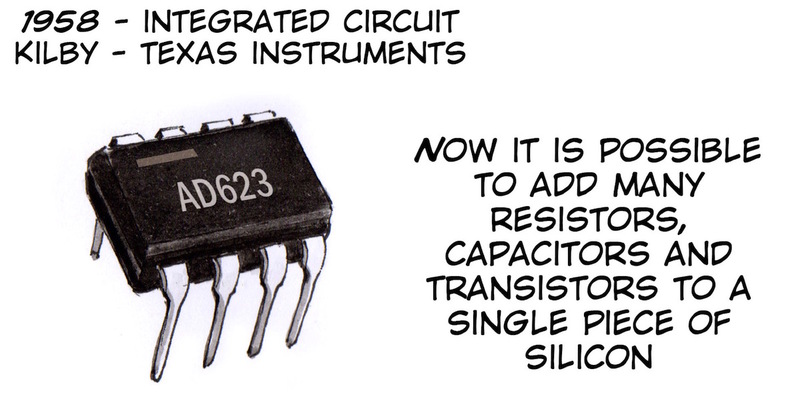 Would it be possible to make a complex circuit on a monolithic piece of silicon? In 1958 the possibility became. With the development of integrated circuits, we entered the modern era, and this is why your SpikerBox has three integrated circuits (three chips!) in its design. Now, where do we find ourselves? Every year components get smaller, less power hungry, and it becomes easier and easier to build electronic boards at low cost.... and there is still plenty of room at the bottom. It's not enough to merely amplify the neural signal, we have to try to record the data to be able to 1) visualize it, and 2) analyze it at a later date. Since neural events are fast (the action potential is 1 ms long), recording such is a challenge. 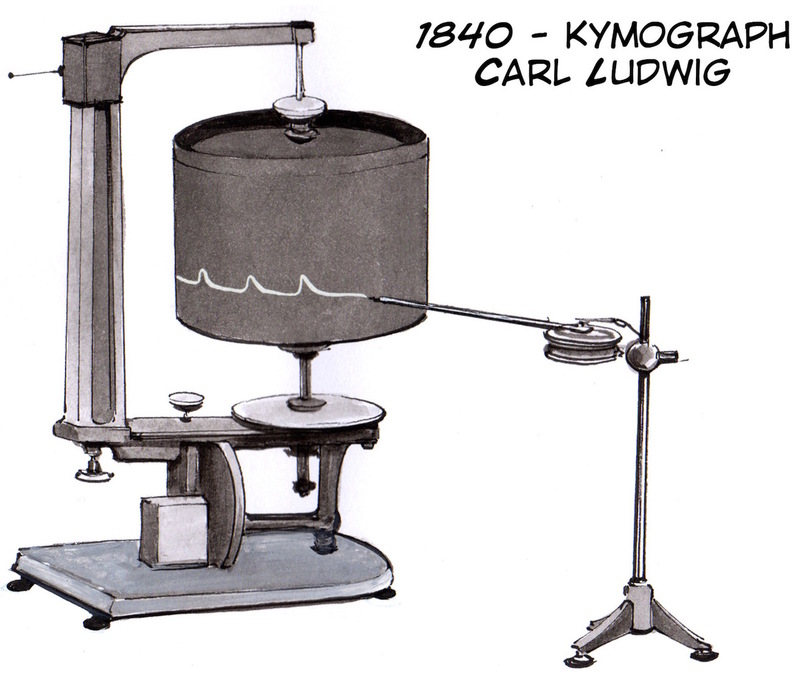 The first notable physiological recording equipment was the kymograph, also known as the "smoked drum." This was sufficient for slower physiological events like respiration and muscle movement, but not fast enough to record neural signals. 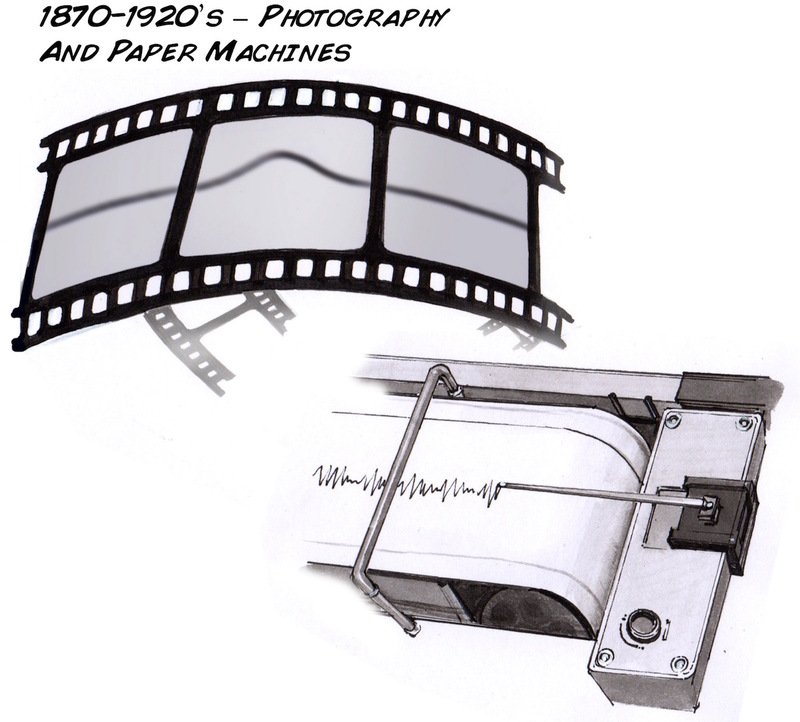 The technology for inventing a recording device rapid enough the visualize the action potential was not available in the 19th century, but Julius Bernstein in 1868 devised a a remarkable work-around that allowed the signal to be repeatedly digitized and averaged, allowing a reconstruction of the neural impulse. The "Rheotome" had a rapidly rotating platter and momentary mercury contacts for both a pair of stimulating electrodes and a pair of recording electrodes connected to a nerve. 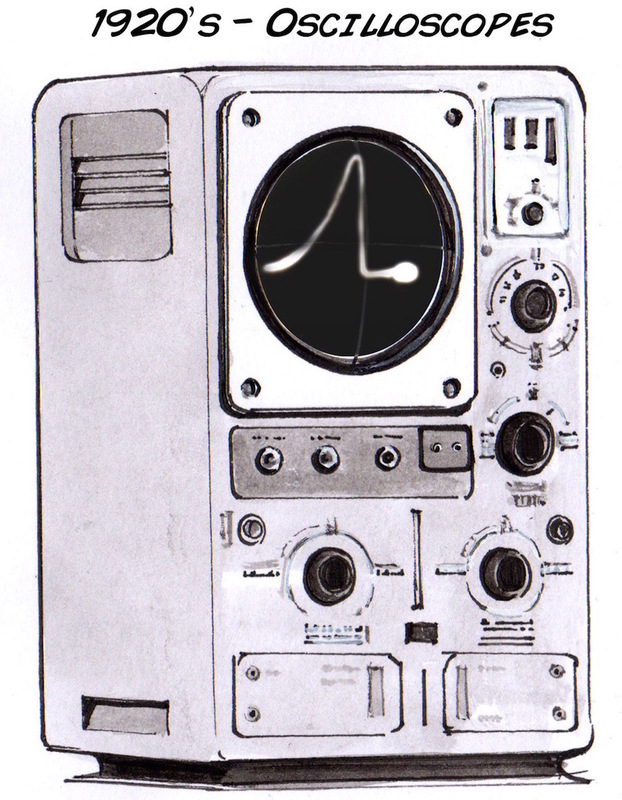 By changing the time difference (space on the platter) between the stimulating and recording electrode pairs, combined with a traditional astatic galvanometer for amplification (see above), and taking many averages, he reconstructed the action potential he called the"negativen Schwankung." Julius, venne, e vide e vinse. Test your German and read the 38 page paper. On the last page, Figure C, our first glimpse is revealed. But, beyond the Bernstein Rheotome, the technology of recording and visualization was limited to photography, videography, and paper machines: All of which are too slow to record the 1 ms action potential of neurons. These three techniques though did allow for steady progress in Electroencephalography (EEG's), Electrocardiography (EKG's), and general physiology of respiration and movement. 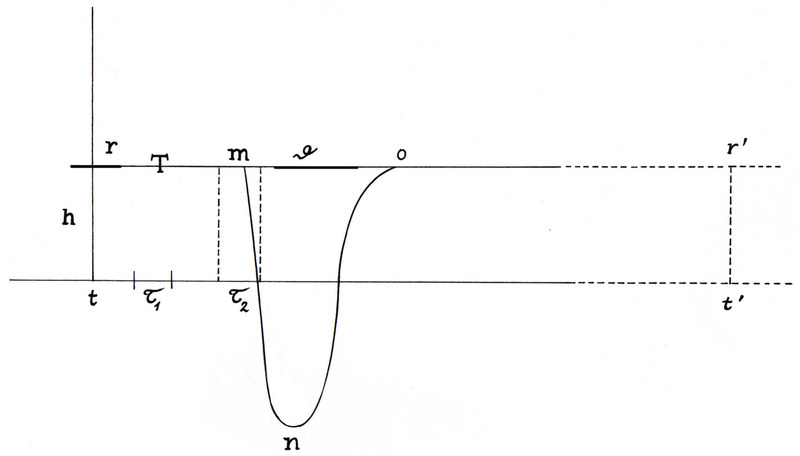 But, to see the individual, un-averaged action potential, live and direct, it took the invention of vacuum tubes, and their subsequent transformation into vacuum-phosphene tubes, to allow us to finally visualize the action potential. Done famously for the first time by Herbert Gasser and Joseph Erlanger in 1922 on a Western Electric oscilloscope, no self-respecting electrophysiology lab today is without a descendent of this device. Now, with the oscilloscope, we could see the action potential, but how can we record it for later data analysis? 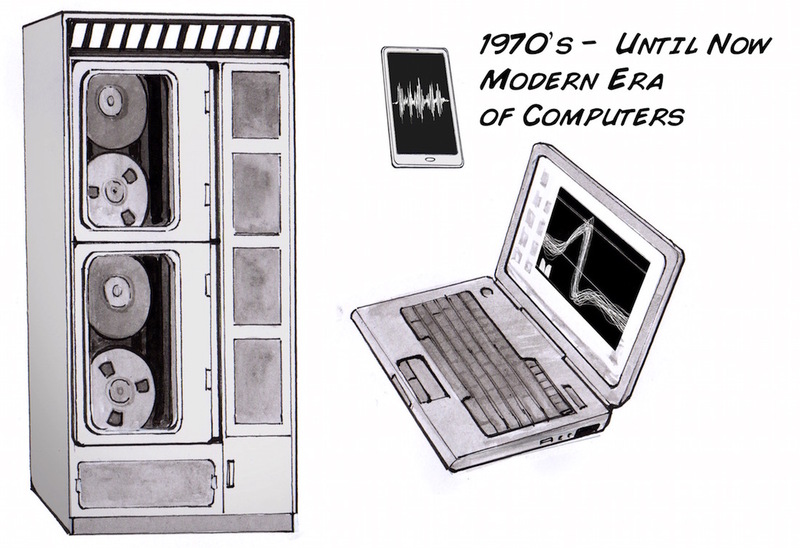 Indeed, Gasser and Erlanger above simply took a photograph of the oscilloscope screen in their seminal publication. 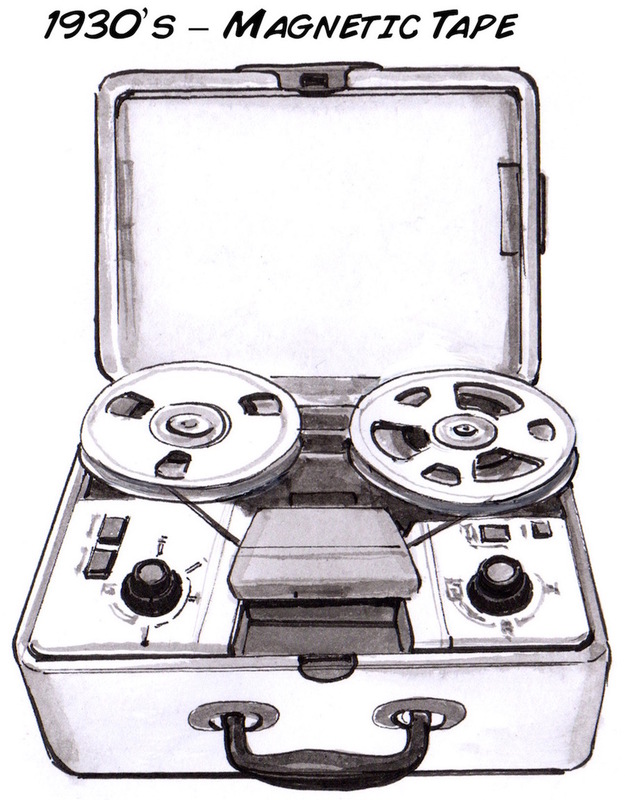 But, once magnetic tape was invented, scientists could have high-fidelity storage of their neural data. If you talk to an electrophysiologist who has some miles (>60 years), they may indeed have some of their graduate thesis data stored on magnetic tape. And now, today, we find ourselves in the computer and mobile era, where we can see and record neural data anywhere we go, anywhere in the world. The third problem, analyzing the neural data from experiments, was typically done by hand calculation until the invention of calculating machines, then computers, etc... Due to the continually growing cultural and economic significance of the Computer Revolution, it is extremely well documented, and we do not occupy ourselves in its very wonderful story here. What lies beyond today? What new technology shall humanity invent to allow us to further understand how brain circuits function? Where does the road lead? Where are we going? A technology currently used by many scientists is called "voltage sensitive dyes," whereby a solution containing a pigment is injected into an animal or applied to the surface of its brain, and the color or luminance of the dye changes depending on the local voltage changes. Some dyes can even also detect levels of calcium, important for neurotransmitter release. The advantage of this technology is that it allows multiple neurons to be measured simultaneously, but the disadvantage is that you have to open the skull to image the brain (*neuro-nerds- shaving the skull to a very thin thickness doesn't count). 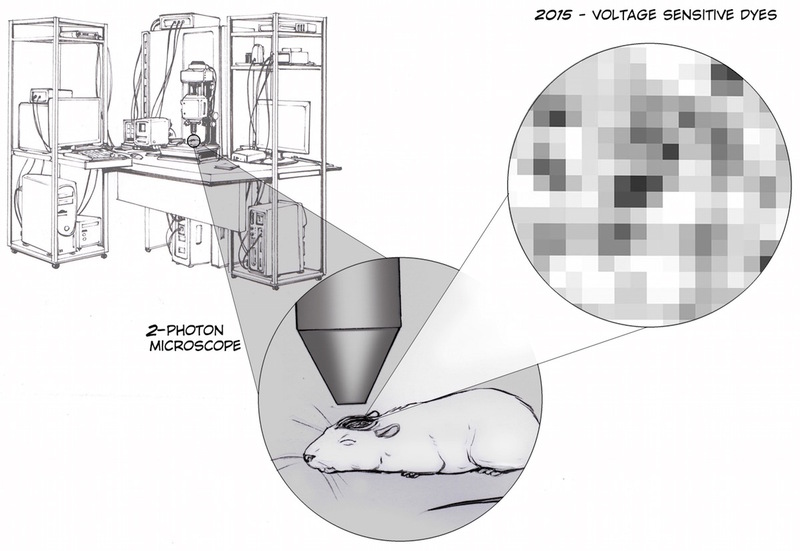 In addition, these experiments often require lasers, 2-Photon Microscopes, and equipment that takes up a whole room. The optics revolution remains to manifest. To record individual neurons in a human brain, as we have stated before, you need to open the skull and insert electrodes. This is cumbersome and risky, and thus is not used beyond medical necessity. 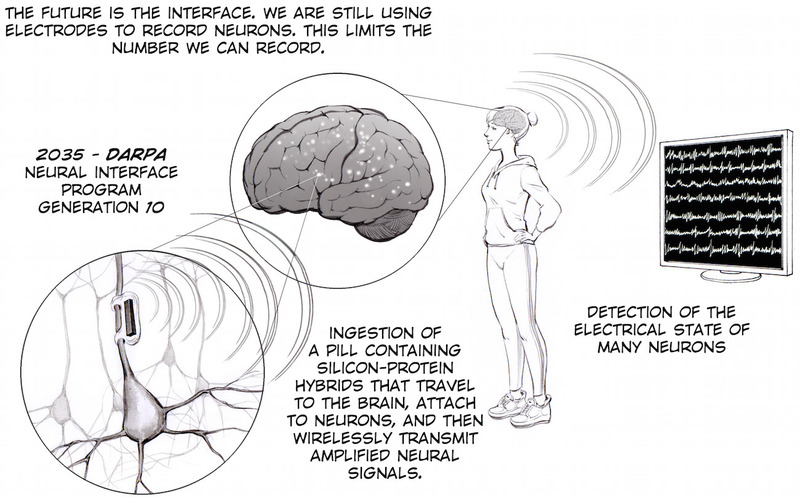 But, perhaps, as electronics become smaller and more energy-efficient, "Nano-Amplifier-Bots" could be ingested that cross the blood brain barrier, attach to neurons, and wirelessly transmit neurosignals. 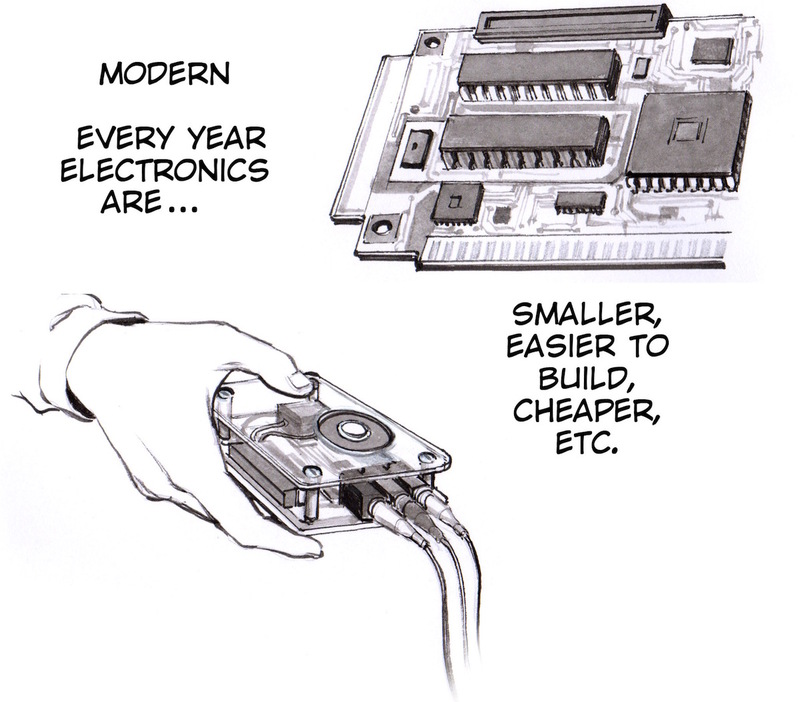 Such technology would indeed be revolutionary, but only partially, as it still requires we "put something" in the body, a crude technique. Will there be a new physics, something as dramatic as electromagnetism in 19th century, and atomic physics in the 20th century, that will enable us to sense neurons in ways scratching the edge of our imagination? Is there a fundamental science, a fundamental type of way the universe works, something as yet not understood, which is all about us yet we cannot detect, that will lead to a new technological revolution? Gravity remains a stubborn force to tackle. Perhaps new understandings will lead to new interfaces and the ability to detect and amplify the voltage of anything from afar. Gracias goes to Italo Ahumada Morasky, a Chilean artist who worked closely with us on this historical treatment.